Who's coming to Columbia? We'll know tonight! The Selection Show starts at 6 p.m. on WLTX. There are still tournaments to be decided and teams could move around but Sunday morning, Jerry Palm from CBS Sports released his final bracket which predicts Duke will be the number one overall seed and the big draw in Columbia. 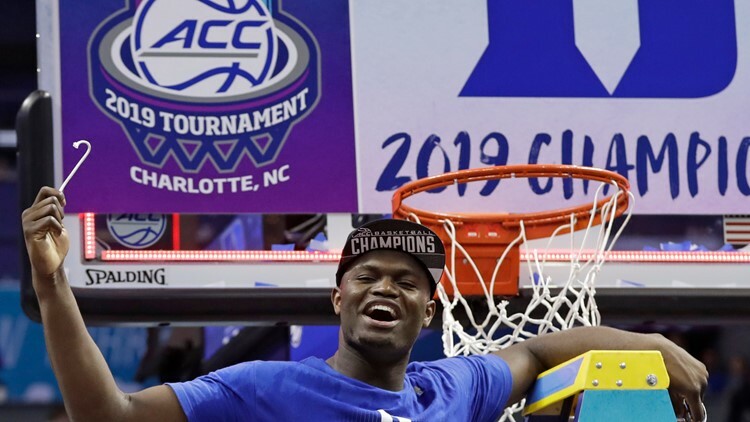 Palm is predicting Duke will be a part of the East Regional whose final will be in Washington, D.C. Duke is coming off its ACC Tournament Championship and what would be intriguing is the demand for tickets to see the Zion Williamson Show. The freshman from Spartanburg Day returned to action at the ACC Tournament after injuring his knee in the regular season against North Carolina and retained his title as the most electrifying player to come along in the last two decades. Palm's bracketology has Duke playing one of the teams from the First Four matchups. Iowa and VCU are coming to Columbia as part of the East Regional bracket. The other heavyweight coming to the Colonial Life Arena is Virginia who would be the number one seed for the South Regional whose final is in Louisville. Palm has Virginia facing Big South champion Gardner Webb in the first round. His other matchup puts UCF against Ole Miss from the SEC. If Ole Miss does indeed come to Columbia, it would be the second time in a little more than a month. The Rebels played USC on Feb. 19, losing 79-64. It would also be a homecoming for Ole Miss sophomore guard Devontae Shuler who is a former Irmo guard. Shuler transferred to Oak Hill Academy for his final two years of high school before signing with Ole Miss. Palm also has Wofford as a 7 seed starting its NCAA Tournament in Des Moines against Baylor. The NCAA Tournament bracket will be unveiled live on CBS and News19 on the Selection Show which begins at 6:00 p.m.